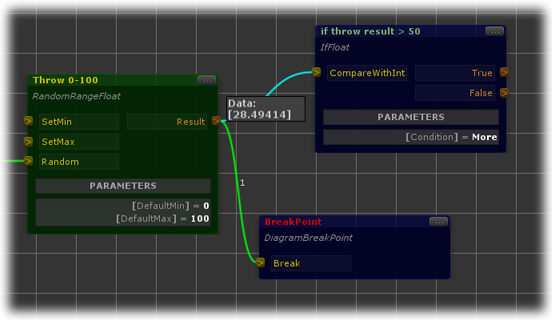 Panthea VS is a modern visual scripting system for Unity game engine. It can be used by anyone from artists to programmers to achieve a wide range of goals: create interactive presentation of the art assets, make quick prototypes, even implement complete game mechanics without writing any code. Work in a familiar environment. One Update to rule them all. With all the freedom it gives. Get it in the Unity Asset Store! Adding life and interactivity to your creations. If you are a part of the team, making some of the tuning for game assets behavior on your side. Even if you are completely unaware of any programming concepts, you can achieve it with Panthea and our complex elements. You will be able to make showroom for your models, walk through your interior and much more (complex elements library is constantly updated). Making quick prototypes to test your ideas. Don’t wait for a programmer to have time for help you. If you want to make a fast prototype for your ideas, with Panthea you can use hundreds of ready elements form the catalogue to do it. Just some very basic understanding of programming concepts will be required (what is a variable, what is a loop, what datatypes exists and so on), which can be easy caught up on the way if missed. Fast prototyping with readymade elements. Making your own elements and tuning their interaction visually. Using visual diagrams as a part of a big project along with the code. Loading game logic externally on runtime. Making the elements for tuning the behavior of game assets, for artists and game designers to use them. There are many ways you can use Panthea in your project to achieve your goals, even if you usually prefer working with the code. Sometimes you need to make a quick prototype, sometimes you want artists or game designers to be able to tune basic game assets logic themselves, or maybe you are creating a game, which require the new logic to be added later without updating the binary – you will find solution with Panthea. 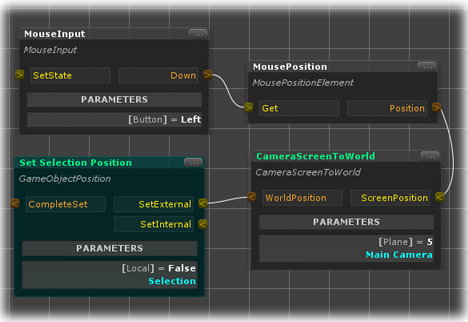 You can work in a familiar environment with minimal difference from Unity native editor view. Moving things around, changing scale, copy/paste, shortcuts, group operations, contextual search – it’s all there. Most of Unity functionality covered in our ever-growing elements catalog. If something is not there already, it will be added in the nearest future. Visual grouping allows to organize diagram view in structured and easy-to-understand way. ScriptableObject has the same life cycle as the usual MonoBehaviour script, however, it is not attached to the objects of the scene as a component, so you won’t end up with tons of scripts attached to objects like it often happens in similar systems. In fact, you’ll need only one Diagram Controller script in the scene, all other code is virtualized inside the diagrams. And you have only one Update call for all the diagrams. While not necessary connected to game assets, diagrams can be loaded and executed at runtime from any source such as file or remote server, which allows extent game logic without updating the binary. Define the flow of logic in the precise way, having multiple flows, called in the defined order with the ability of multiple output links. Inverting input and output points. Ability to adjust the appearance of the diagram by minimizing elements (reducing to a compact form), hiding parameters. You can debug your diagrams, setting breakpoints, observing the data, transmitted between elements and the value of variables, if they change during operation. Instantiated diagrams can be created and launched as multiple independent working copies with the transfer of data to them and the possibility of manually deleting the created instance, in case its work is completed. So, you can have a diagram with a complex logic for some object, and then create many such objects. Element can have as many input and output points as you like, also their set can be configured depending on the parameters. You can extend the elements catalog with your own elements. Elements can be complex, up to the complete mechanics of game, or as simple as possible. Elements development is simple, with minimal possible difference from scripts based on MonoBehaviour. You can set up the communication in both directions between diagrams and normal code based on messages, and execute the diagram from normal code. This way you can use Panthea along with other solutions as a part of something greater. Message-based communication and links between diagrams. With the use of messages (events) you can break complex logic into smaller parts, having specific diagrams responsible for them. These parts can interact with each other either directly with transferring logic flow from one diagram to another or indirectly, with broadcasting and receiving messages. You can view the scheme of interaction between diagrams in a separate window (when using specialized transition elements from the catalog).